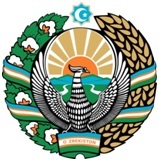 The law “About the State Emblem of the Republic of Uzbekistan” is adopted on July 2, 1992 at the tenth session of the Supreme Council of the Republic of Uzbekistan. In the center of the coat of arms Humo’s bird with the opened wings — a symbol of happiness and love of freedom is represented. Our great ancestor Alisher Navoi characterized Humo’s bird as the kindest of all living beings. In the top part of the coat of arms there is an octahedron symbolizing a sign of the statement of the republic, inside – a half moon with a star.